Chhat Puja 2009 Courtesy TopNewsBlog The 2009 Chhat Puju Festival. 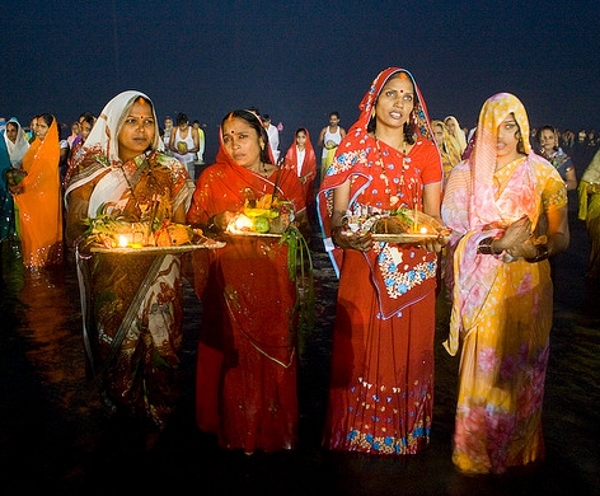 The four day Hindu festival of thanksgiving, Chhath Puja, runs from November 10th to 13th this year. The ritual, held in order to thank the Hindu god of the sun Surya, is one of the most elaborate traditional ceremonies held on the sub-continent. This year thousands of devotees will flock to Delhi in observance of these age old rituals. According to the news today, officials have laid the preparation groundwork for what could be the biggest turnout ever. All along the river banks, throughout the city of Delhi actually, officials have planned and laid out precautionary steps to ensure the 2010 Chhath Pujua festivities run smoothly. But, as anyone knows, Delhi is prone to massive traffic jams no matter the preparatory measures. Even this year’s festivities planned for the Sanjay Gandhi Biological Park (zoo) are the subject of some concern, as some 25,000 to 35,000 visitors are expected there alone. Somehow though, Indians always manage to live it up at this festival without too much conflict. The essence of these celebrations obviously providing a prevalent thankful overtone. For those unfamiliar with this ancient ritual, giving thanks for the bounty of all India at this time, is in fact as old as India itself. 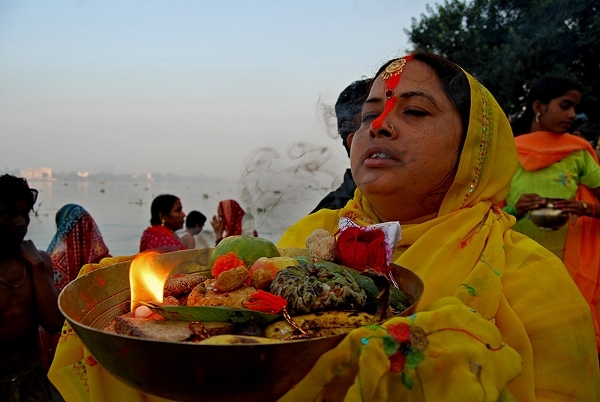 References to Chhath Puju can be found in the oldest texts in existence. Perhaps the most noted observances of these ritual thanksgiving ceremonies are the ritual bathing and abstinence of the individual observers – during the 4 days most people sleep on the floor with only a blanket for comfort. Of course there is much more going on during this time, but a Western equivalent to the celebrations would obviously be Thanksgiving in America. On the holistic side of things, Chhath Puja is a very good detoxification time, and some observers partake of daily sun meditation, among the many other activities associated. The images and video below reveal the glowing spiritual nature of this celebration. Songs, food, dance, a whole series of events and celebrations focused on being thankful for what the people there have – what could be more genuine and uplifting. Visitors to India during this time of year will obviously be treated, and cursed a bit too – crowds there being what they are. Interestingly, as old and popular a tradition as Chhath Puju is, the festivities are not considered government holidays. On Tuesday the BJP Party actually requested they be made so. 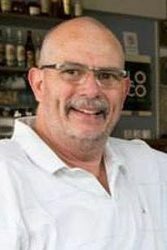 This would seem to alleviate some of the tension surrounding the celebration where safety is concerned, alleviating some of the traffic and conflict. In any event, we wanted to share this festival with the readers, and to wish those celebrating a safe and enriching celebration for 2010.